Canadian poet of Lebanese descent Leila Gorguis tells through her poems the story of an immigrant who has seen herself incarnated within many different women. Her poetic style ranges from rebellious to serene and mellifluous. In «I am here; I am there», Leila steps into the shoes of an emancipated Shirazad, liberated from mythology: « For a very long time, women in our sad Middle-East were confined to use their innate intelligence to merely survive, not to live ». She believes that the Lebanese civil war of 1975-1990 has given her not only strength but also the will to live and tell her story to her people; half of which have survived while the others immigrated. Today, she is a free woman, telling the story of an immortal Lebanon, of a peaceful Canada and of a Montreal filled with dreams and opportunity. On August 2nd, 2012, the Youth and Culture Center (YCC) – Zouk Mikaël, partnered with Lebanon Development Union (LDU) and the St-Doumit Parish to organize a book signing for Leila Gorguis’ poetry anthology « I am here; I am there » (published by Al-Farabi). 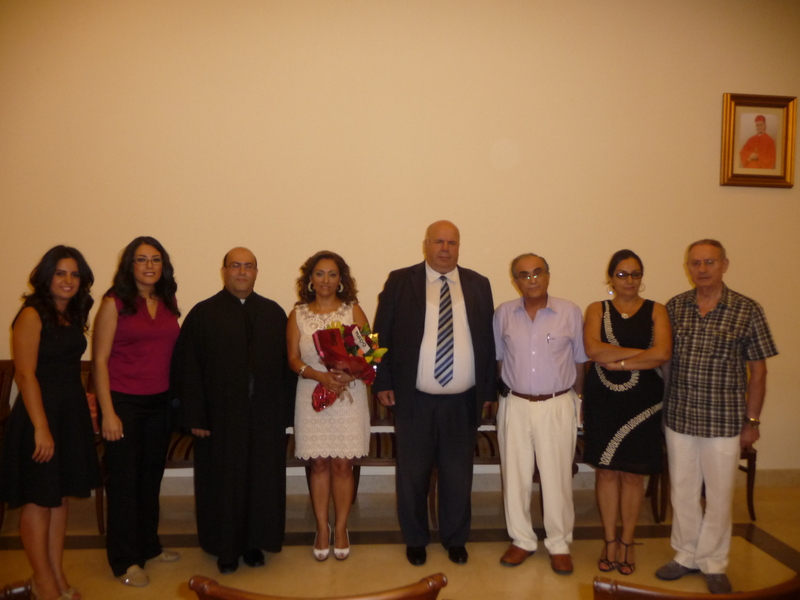 The event took place in the Parish’s reception hall and in the presence of many dignitaries, of whom Josiane Khalil, President of the League of Mukhtars of Kesrouan/Ftouh, Father Boulos El-Reyfouni, head of the St-Doumit parish, Antoine Abou Jaoudé, president of the National Cultural, Environmental and Heritage Union, General Emile Abou Hamad, head of Public Relations of the Union, Fouad Abou Farhat, representative of the Cultural Dialogue Circle and Élise Moussa, board member of Lebanon Development Union – LDU. YCC Director, Eliane Fersan, launched the evening by highlighting the creative minds of the foreign Lebanese community and the responsibility taken on by Lebanese emigrants to promote the Arabic language in their respective countries of residence and in the western world in general. Ms Fersan stated as an example the fact that Leila Gorguis is a member of the UNEQ (Writer’s Union of Quebec) and the importance that the union attributes to her published works, especially to her books in Arabic which are now a part of the Quebecois and Canadian culture and body of literature. Several literary figures took an active role in the event by sharing their own analysis of the anthology. Writer Mireille Saab described « I am here; I am there » as a dialogue between shadow and fire, and whispers of passionate exhilaration. She views the poems as a sanctuary for lovers, rebels and universal femininity, failures and successes, with words that emanate light and salvation. Dr. Zahi Nader, member of the Lebanese Writer’s Union and Secretary general of the Arabic Folk Union, mentioned that Leila’s poetic path reflects the poet from here and from there, both inside and out. The « I » goes beyond the individual who disappears in his own shadow, absorbing the one cast by life as an immigrant. This writing style demonstrates uniqueness, reborn within its femininity, maternity and within the distance from the far-away land one’s soul was torn away from. Writer Isabelle Zougheib Kesrewani follows suit by commenting that she sees through Leila’s work, a woman who is her own best friend, refusing to drag along used up traditions; that she sees a woman whose life experience has made keener and within whom has awoken the voice of a woman proud of her existence and humanity; like a tree full of fruits and branches. Father Boulos El-Reyfouni then took the stage and thanked Leila Gorguis for the donation she made to the parish describing her as a woman swimming in Phoenician ink only to cross over and reach the shores of her reader’s minds. After having read a few poems, the poet extended her gratitude towards the Youth and Culture Centre and the City of Zouk Mikael for their warm welcome during her stay in Lebanon. « My soul, torn between Beirut and Montreal, has for the first time landed in a place that has allowed me to embrace all of Lebanon at once. I am grateful for its homes, hanging like a gift from history, and for its stairways, leading towards a sky full of dreams and warming my Canadian winters.